What better to keep coins than a counting sheep? 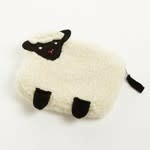 This zippered fleece-covered coin purse looks just like sheep right down to the tip of its tail. From the artisans of Mai Vietnamese Handicrafts, based in Ho Chi Minh City.